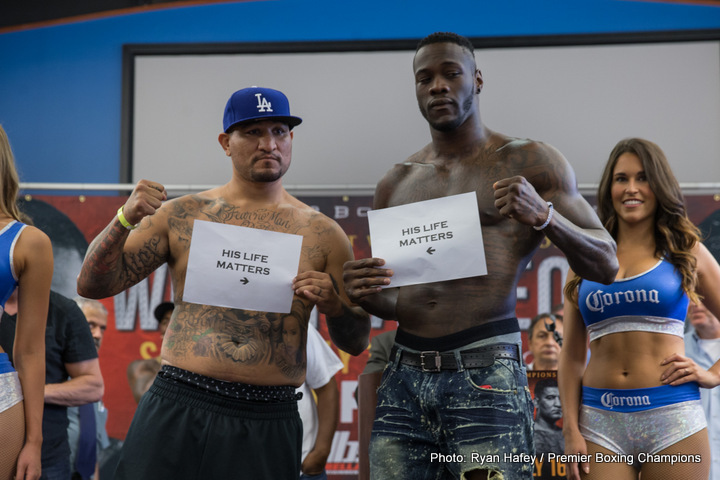 Deontay Wilder was forced to reorganize against Chris Arreola, after his scheduled matchup in May with Alexander Povetkin got shelved due to an irregular-trace amount of a newly banned substance. Likely, Wilder will have to face Povetkin in the fall, that’s if the WBC agrees with WADA’s recent adjustment in their rules on meldonium. So it’s Arreola for Wilder to remain active near his home in the city of Birmingham, Alabama. If the main event doesn’t do the trick, the co-feature pits unbeaten Sammy Vasquez in tough with 2008 gold medalist Felix Diaz. Last year this scribe along with many other avid boxing fans saw Cristobal Arreola as a perfect test for Deontay Wilder. Arreola’s March 2015 bout with Curtis Harper was a fun slobber-knocker. Fred Kassi settled for a draw versus ‘The Nightmare’ in a highly contested outcome last July. In December, Chris went life and death with veteran brawler Travis Kauffman. The point here is there were a few better names in the WBC Top-15 ranking to choose from. Wilder looked great on the move in his 2015 meeting versus Bermane Stiverne. However, Stiverne is more effective when a guy comes to him, making Arreola coming forward a different challenge. Wilder will have to deal with Arreola’s heart, power, and chin to not only withstand punishment, but dish it out as well. Deontay will have his hands full for at least 4-5 rounds possibly similar to his bout last September against Johann Duhaupas. If Arreola makes it to the mid-rounds it’s likely he will begin to gas and get hit flush the rest of the fight. A two-sided TV fight turns one-sided down the stretch. The PBC on Fox co-feature could steal the show in what should be an entertaining scrap between Sammy Vaszquez and Felix Diaz. Both fighters have stepped up in competition and looked good doing it. Even in a loss last fall to Lamont Peterson, Diaz fought him extremely close. Sammy Vasquez was supposed to fight Luiz Collazo until an injury changed that. Diaz has a tremendous amateur pedigree with an Olympic gold medal and a few impressive outings as a pro versus quality boxers. Last June on a CBS Sunday afternoon card, Sammy Vasquez and Wale Omotoso engaged in spirited fight. In that bout and a few others, Vasquez has shown some vulnerability by getting hit flush. On the flip side, Vasquez has proven to be a skilled and versatile prospect that likes to keep a steady work-rate. Expect this bout to go back and forth as the shorter Diaz attempts to close distance. At times the action will be in the pocket with plenty of exchanges as they battle to control momentum. Vasquez will do just enough banging mixed with boxing to land the cleaner punches.